Your orthodontist may have told you that you need to have spacers before your braces go on. What does this mean? Some of your teeth may need brackets that are attached to metal bands that go all the way around the tooth. * Usually, the bands are used only on molars. 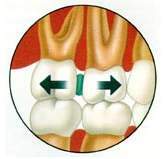 If the space between your molars is very tight, it will be difficult for the orthodontist to put the bands on the teeth.Therefore, space must be opened up to fit the bands in. This is where spacers come in. Spacers are little rubber nodules that fit between the teeth. In some cases, your orthodontist may use a metal spacer, which looks like a tiny metal hinge. The spacers stay between your teeth for several days and move the teeth apart slightly. You wear the spacers 24/7 until your orthodontist removes them. Do not floss teeth that have spacers between them (it will be impossible)! Are spacers uncomfortable? Yes, they usually are. It feels like you have something stuck between your teeth -- and you do! In some cases it may be more than just uncomfortable; it may ache. If so, take pain reliever (such as ibuprofen) as needed. Spacers usually stay between your teeth for several days; sometimes for as long as 10 days. The spacers are taken out before your braces are put on. The braces don't hurt like the spacers; in fact, when the spacers are removed, it feels so much better, even after the braces are put on! *Why do some teeth need metal bands instead of regular brackets? Fillings. If you have a filling that protrudes to the outside of your tooth, brackets cannot be glued to these fillings. Therefore, a metal band must be wrapped around the tooth instead. The bracket is attached to the metal band.